Alstom’s Coradia iLint, a hydrogen-powered train. Credit: Alstom. UK Transport Secretary Chris Grayling has said he wants to see hydrogen trains on Britain’s rail network in the near future. Grayling was responding to a question from Labour MP Paul Blomfield about the environmental implications of the government’s decision to cancel the electrification of the Midland Main Line north of Kettering. “I expect to see a transformation of technology on our railways over the coming years, with the introduction of different types of battery electric hybrid trains and hydrogen trains. I see that as a priority,” said Grayling, speaking in the House of Commons on January 18. Alstom is currently trialling its hydrail passenger train technology in Germany, attracting interest from all around the world. It works by exposing hydrogen to oxygen to produce electrical energy. This then powers the electrical traction drive and stores any excess energy in lithium-ion batteries. The only direct emissions from the train are steam and condensed water. Alstom’s solution is based on its Coradia Lint DMU. 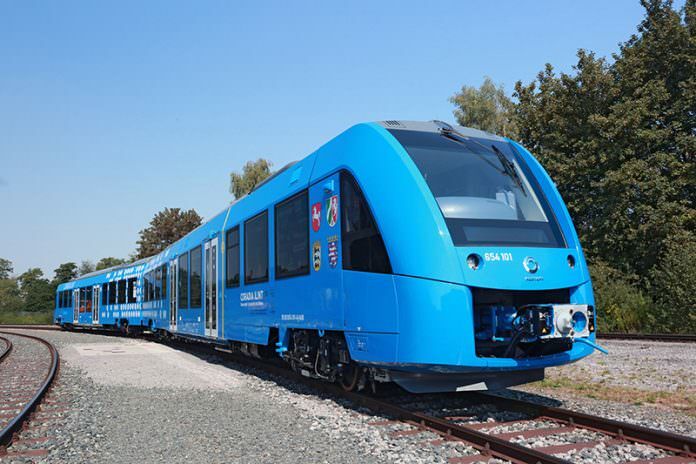 Alstom says its hydrogen-powered iLint is capable of matching the performance of regular regional trains. The two-car prototype currently being tested has a top speed of 140km/h and a range of up to 800km. Not sure about Hydrogen powered trains for the UK. Hydrogen is a useful source of gas but also it’s very flammable and even very dangerous if not contained very carefully. I think EMU, DMU/DEMU and EDMU/Bi-Mode trains is better and can reduce pollution on UK’s railways. As more new trains are to be manufactured for the UK in the upcoming years ahead. But of course, anything which delays modernisation, and especially which steers clear of electrification using wires, is meat and drink to blinkered AND short-sighted British politicians – in London anyway. Our (English)horizons are totally limited. Yet wiring of railways continues all over the world – repeat ALL OVER THE WORLD!! Except in the miserable southern part of the British Isles! What on earth can we do to escape from this malaise? According Wikipedia ‘Industrial production [of hydrogen] is mainly from steam reforming natural gas, and less often from more energy-intensive methods such as the electrolysis of water. B) is produced by a system that consumes more energy than just producing electricity. Hydrogen is created using electricity. That electricity can come from any source. It can also be usefully produced by intermittent power such as wind, so large wind farms in remote locations can be used to create large quantities of hydrogen, as can excess energy caused by renewables overnight. So although hydrogen is like batteries: it’s not carbon neutral in itself, but it’s not tied into fossil fuels either. I just wished Grayling had come up with something more than pious hopes.